Recently, I had an amazing experience attending a local One Billion Rising event. I enjoy taking photos and video of special events like this one. I spent the afternoon following the event creating an Animoto mash-up of the photos and video taken while I was at the event. The process of putting together the video mash-up provided a great opportunity for me to deeply reflect on the event. I saw and experienced things I did not get to during the event. This experience made me think this would be a great learning activity. To create, as a means of reflection, a video mash-up of photos and video taken during a community service project or a social cause event. To learn some skills related to ethical photojournalism. Ask learners to identify a community service event or an event that is promoting a social cause that they would like to attend. Examples include serving meals at a holiday event, a dance fund raiser for a charity, collecting food for local shelter, neighborhood clean-up, or a community rally like One Billion Rising. Many news shows feature weekend events that include these type of events. For younger kids, this could became an activity for parental engagement. Parents and/or parent volunteers can help with the travel and logistics. A Google spreadsheet could be set up to list these. Prior to the events, review with learners how to take photos and videos at public events. 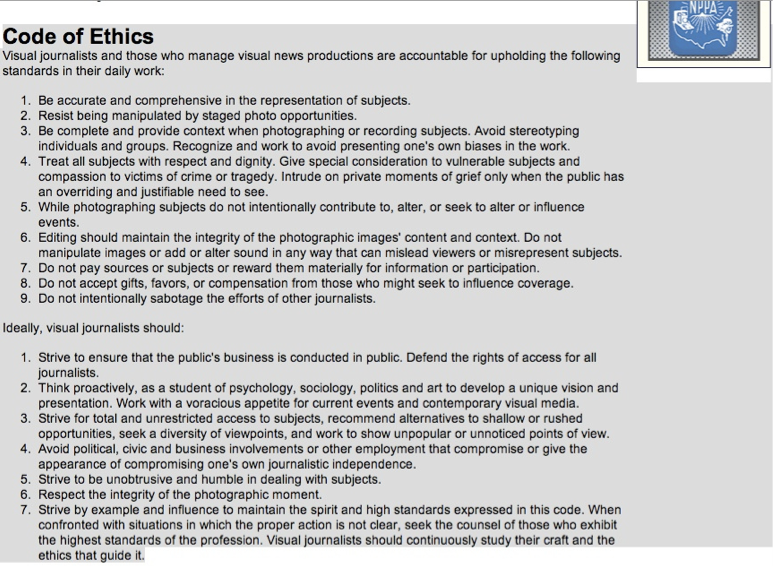 As learners will be acting in the role of photojournalists, go over the National Press Photographers Association Code of Ethics. Practice sessions can be set up where learners take photo and/or video of their peers during learning activities. To further reflect on their experiences and video, learners can answer some of the following questions via a blog post or a Voicethread where the video has been uploaded. What about your community involvement has been an eye-opening experience? Describe a person you’ve encountered in the community who made a strong impression on you, positive or negative. How has the environment and social conditions affected the people at your site? Has the experience affected your worldview? How? Why does the organization you are working for exist? Did anything about your community involvement surprise you? If so, what? What did you do that seemed to be effective or ineffective in the community? How does your understanding of the community change as a result of your participation in this project? How can you educate others or raise awareness about this group or social issue? Talk about any disappointments or successes of the project. What did you learn from it?